Seriously! 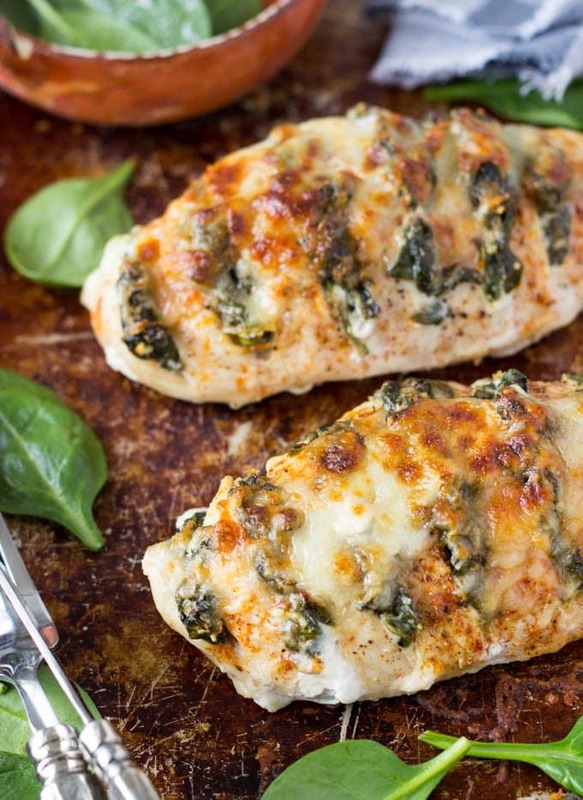 This is one of the easiest and quickest ways to make super delicious and flavorful chicken breasts. 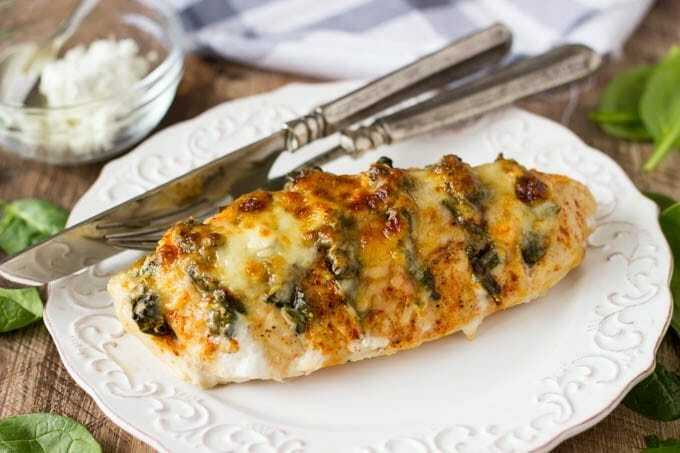 By making slits in the chicken breasts (Hasselback) and stuffing them with tasty things like spinach and goat cheese, you’ll get a hit of savory cheesy goodness in every bite! 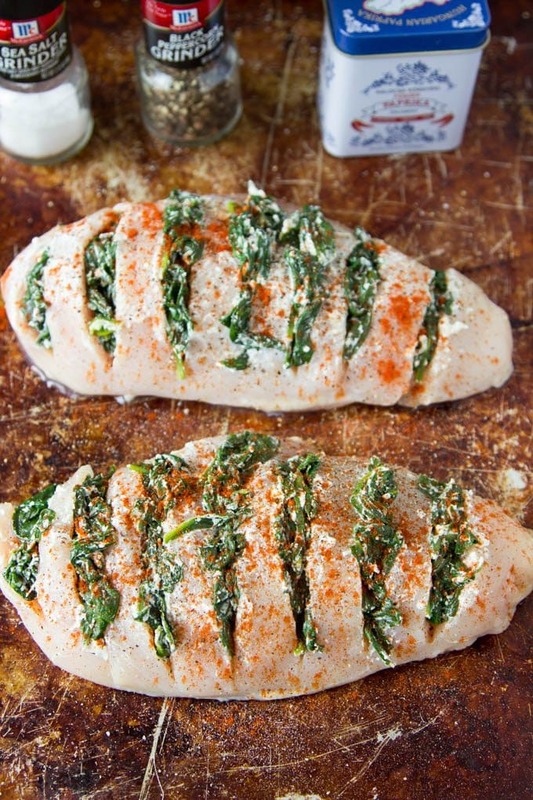 Spinach + Creamy Goat Cheese Hasselback Chicken- I ♥ you! You are my new favorite way to cook chicken. Recently a video popped up on social media showing how to make hasselback chicken and I thought..wowza! that looks amazing and so easy I HAVE to try it out! and guess what? wowza! it was so EASY and I loved that you get a bit of all the “good stuff” (spinach + goat cheese) in every bite. If you havent heard of “Hasselback” before it’s a technique originally developed at a restaurant in Sweden (called Restaurant Hasselbacken ( or so the story goes) where they made small slits in a potato (kind of like an accordion) and stuffed them with bacon and cheese. The results, crispy potato outside, soft potato inside and goodness (bacon and cheese) in every bite. 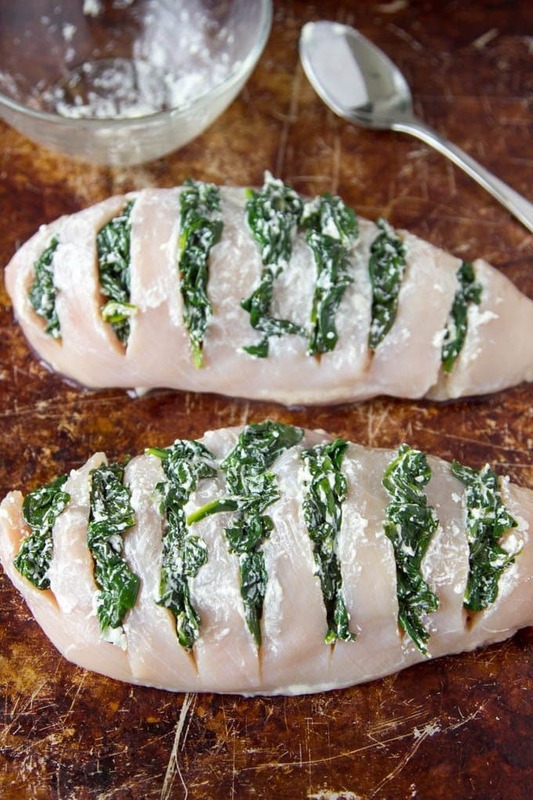 These days you’ll see lots of things that have been cut “Hasselback” like apples, sweet potatoes and now chicken. 2. 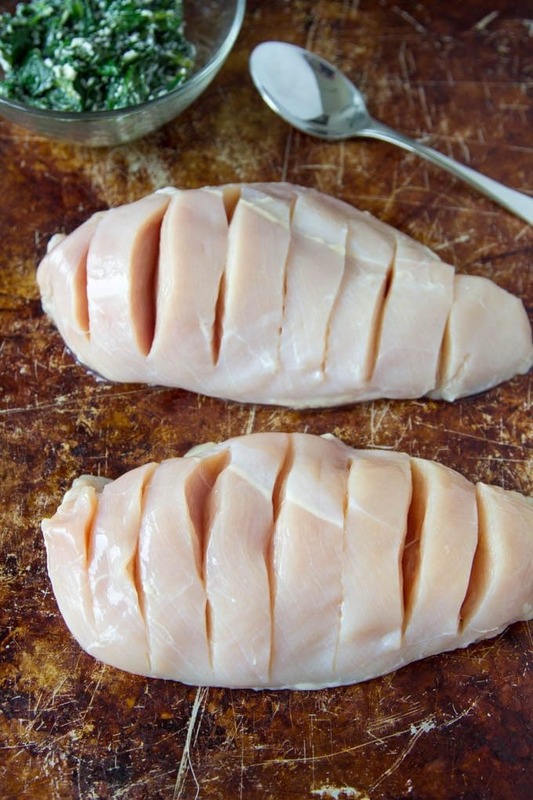 Cut slits (about 1/2 inch apart) across the chicken breast, about 3/4 of the way through the breast(careful not to cut all the way through). 3. Stuff each slit with the spinach and goat cheese mixture. 4. Season with salt, pepper and paprika. 5. Add a little mozzarella cheese (or cheddar) and pop them in the oven for about 25 minutes. That’s it! I switched my oven from bake to broil for the last 10 min. of cooking so the cheese would get extra bubbly and browned. 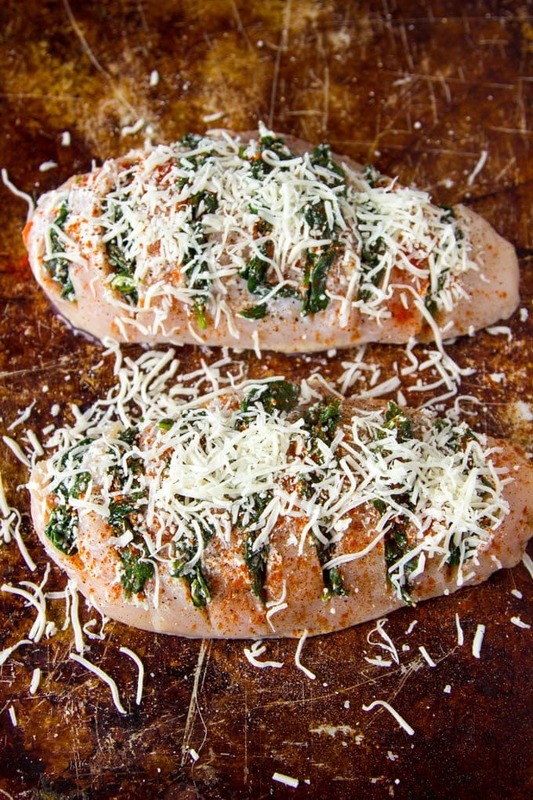 This is one of the easiest and quickest ways to make super delicious and flavorful chicken breasts. 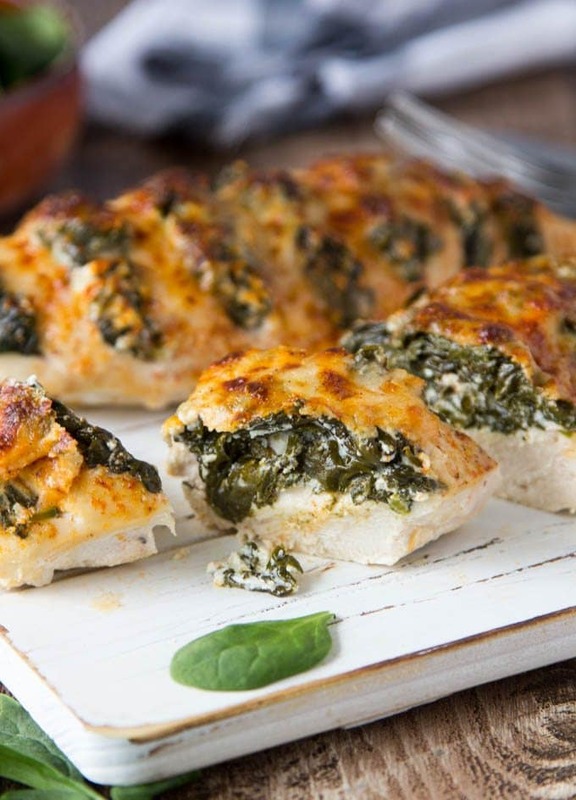 By making slits in the chicken breasts (Hasselback) and stuffing them with tasty things like spinach and goat cheese, you’ll get a hit of savory cheesy goodness in every bite! What did you do for side items? Pasta? Veggies? Love this dish! My 2nd time making it, this time I added sun dried tomato spread. So good! Thanks Stacey! love the idea of sun dried tomato spread! Hi Amy…I updated the recipe card to include the grams of sugar. Super low for this recipe at 0.6g/serving. I made this dish last night almost according to the directions. 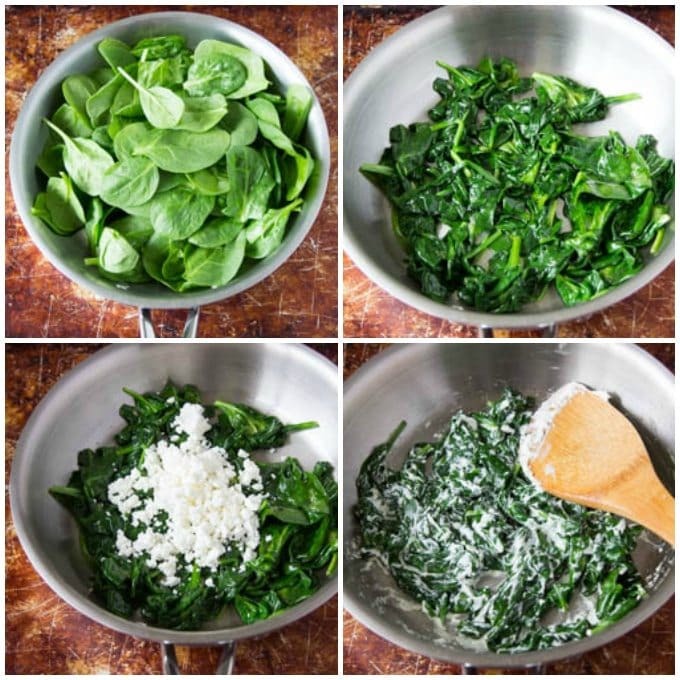 I did add about a tablespoon of minced garlic to the spinach as it was cooking. I also added a little Parmesan on top of the mozzarella and did the broiler a few minutes at the end, like suggested. It was OVER THE TOP DELICIOUS! We will have this again and again, plan to serve it to some guests arriving in a few weeks. Thanks for posting this wonderful recipe.